Registering on the site allows you greater access so it is worth doing this as soon as you begin your A Level courses. You might have an idea of the course you wish to undertake but the first time you log on to the site you will see all that is on offer. If you’re still considering what your options are you will find a sub site which helps you to choose the course that is right for you. There is something called the Stamford Test which is a simple online questionnaire which attempts to match student interests with abilities and suggest appropriate higher education courses. There are many different routes you can take, for example foundation degrees which are linked to employment, graduate degrees or post graduate if you already have the appropriate qualifications. In addition there are a number of course modules which you may like to take and accrue credits towards a degree – all this is explained on the site. Each course at each university have entry requirements. This is a search that is easily done through the UCAS platform. There are many tools to help you through finding out if you are eligible for a course, such as Entry Profiler (essentially a course sorter tool) and admission tests to see if you are eligible for a course (examples are medicine and dentistry). Once you have selected your course and universities then you can begin the application process – make sure that you note the lifetime of the application and key dates when things like academic references etc. have to be in. Closing dates for course applications and eligibility must also be clarified (this may include predicted grades). Remember that you can get your predicted grade from Oxford College once you have fulfilled the course requirements. This will normally be completion of at least three assignments from each part of the A level, so three from the AS and three from the A2. If you haven’t started your A2 part of the award your tutor will not be able to predict a grade for this. Therefore you may only have a prediction for the AS part of the award – so you must be clear when completing the UCAS application whether you need to have the full A level predicted grade. This normally affects fast track A level Oxford College students more than the 2 year course students because of the application windows. However, if you understand that a predicted grade is a professional judgement of academic ability based on assignment scores, consistency and tutor judgement then you will see how important it is to complete these assignments. Predicted grading is not just an average of scores. 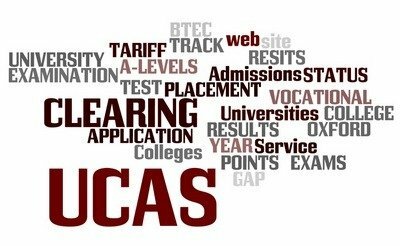 The UCAS site will also provide details of credits or points gained through study or part of study, and how this affects your entry requirements. For specific information on this visit the UCAS site. UCAS references are normally provided by someone who has known you for at least one complete academic year and can write about whether you suit the course chosen. Therefore your Oxford College tutor is not the correct choice for this. You can however obtain a formal student status confirmation from Oxford College which is in fact conferred with your predicted grading. It is up to each individual tutor whether they will provide a UCAS reference or not, and students should never assume that they will, so should never divulge tutor email addresses and details to universities or other institutions, without permission from the tutor themselves. Once your UCAS application is completed and submitted then you will need to wait for notification of interviews and provisional offers which are subject to final A Level results and available places. Once your A Level results are confirmed then you can notify UCAS. If however, you didn’t get the results you needed or you’ve done much better than expected you will need to register for the UCAS Clearing process. Clearing is simply a way for universities to match their empty slots with suitable students that have been left without places. If you find that you haven’t quite got the marks to gain that coveted place at your chosen university then don’t necessarily panic. Head for the Clearing process – before you do, arm yourself with the right information. You’ve had your results. They’re not quite enough to gain a place on your firm or insurance offer from university of choice or you’ve done much better than expected and what to upgrade to a better university or different course. *You might have asked for a re-mark, in which case you’ll have to present this to your college by the 31st of August. If you cannot do this on time, then ask them to extend the deadline for you. Clearing collates all of the available university places, and distributes them on a first come, first served order to the most suitable candidates. All available places will be listed from 18:00 hours on the 12th August – results week. If you’re in Scotland, Clearing already started on August 3rd. Clearing is available for anyone who meets the conditions above, to use, between July and September. If you already have your exam results but you have no firm or suitable offers, you can use Clearing from July. But, if you had conditional offers but your exam results didn’t live up to your expectations, then you may use Clearing from results day. How do I register for Clearing? Simply go online, and register here for a UCAS Undergraduate Course. You register as normal but don’t select/fill in the Course Choices. Once registered, you’ll have your own identification number and password. You can log in anytime and see how things are progressing. You’ll receive an email explaining all of this and it contains your Clearing number. Look at the list online once it is available, and see if there are any courses that would be suitable for you. Be prepared to ring around different colleges and universities, and chat about the courses on offer. Ask them whether they would be prepared to accept you. *Even if they have turned you down before, they might reconsider you if there’s still a place available. Get some informal offers, and add a Clearing Choice in Track on your online Clearing account. Then do your homework, a bit of legwork. Go and have a look at those universities. Check out their online reputations, and if you can, go and see them in person. After all, you may have found the place you’re likely to spend the next three or four years of your life! Didn’t get the grades you needed? Check out our guides to what to do if you failed your A Levels and need more UCAS points.